The Metropolitan Redevelopment Agency promotes redevelopment (both housing and commercial) in distressed neighborhoods. The Metropolitan Redevelopment Agency promotes redevelopment (both housing and commercial) in distressed neighborhoods. This is accomplished through strategic planning, creating metropolitan redevelopment areas, working with community groups and leaders to establish their priorities, purchasing property for projects that can act as an anchor for other new development in the area, issuing requests for proposals (RFPs) to develop the City owned property and then setting up public/private partnerships where the private sector is the developer. The Metropolitan Redevelopment Agency utilizes resources of the Metropolitan Redevelopment Fund and Federal Community Development Block Grants, as well as other funds that include local and state capital funds. The community plays a vital role in the success of the Metropolitan Redevelopment Agency. Without community input, ideas and cooperation, the agency would not be able to redevelop anchor properties to revitalize parts of Albuquerque. The Metropolitan Redevelopment Agency also provides staff and administrative services for the Albuquerque Development Commission. 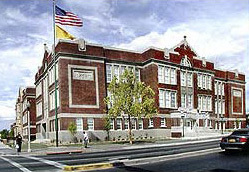 Albuquerque’s Metropolitan Redevelopment Agency is responsible for infill development in established Metropolitan Redevelopment Areas (MRAs), and in accordance with the centers and corridors approach to development outlined in the Comprehensive Plan and the City of Albuquerque’s goals. The centers and corridors concept provides a rational framework for the efficient allocation of public and private resources, concentrating on land uses for greater efficiency, stability, image, diversity and control. MRAs and centers and corridors are the areas where problems caused by lack of investment and deterioration have created the need for special intervention on the part of the City. When a municipality has complied with the provisions of the Redevelopment Law [3-60A-5 to 3-60A-14 to 3-60A-18 NMSA1978] concerning public hearing and designation of an area as a metropolitan redevelopment area, it may prepare a metropolitan redevelopment plan; however, prior to final consideration of the plan by the local governing body, the plan shall be the subject of at least one public hearing held by the mayor or his designee, or the municipal planning commission, at which time comments from the public as a whole can be gathered and considered by the municipality in its preparation of the final plan. Following the public hearing, the local governing body may approve a metropolitan redevelopment plan. A metropolitan redevelopment plan may be modified at any time; however, if the plan is modified after the lease or sale by the municipality of real property in the project area, the modification shall be subject to any rights at law or in equity a lessee or purchaser, or his successors in interest, may be entitled to assert. Any proposed modification which will substantially change the plan as previously approved by the local governing body shall be subject to the requirements of this section, including the requirement of a public hearing, before it may be approved. *Effective January 1, 2019 -- The Metropolitan Redevelopment Bond requirements and fees will be updated. For more information please contact Karen Iverson at (505) 924-3814. For inquiries, please contact the Metropolitan Redevelopment Agency team at (505) 924-3814.